Auckland’s best live entertainment for corporate functions, weddings and events. We aim to make your event an unforgettable experience. Wolves and Ravens are experienced musicians who believe in setting the perfect mood for any occasion. We will work with you to understand your event, and create a tailor-made package for your needs. Our collaborations with event organisers, wedding planners, corporations and private clients gives us the expertise to help you create the ideal atmosphere. Wolves and Ravens specialise in getting the party started, and will customise our set-list to suit you. We focus on well-known songs that connect with the audience, and we will keep your dance-floor full all night. For cocktail functions and black-tie events, we have a Jazz and Soul option in either a band or duo format. We are a full service entertainment company, and provide sound systems, lighting and microphones for our events. We have a wealth of experience in performing at a range of occasions. View Testimonials from amazing clients we have worked with. Check out out sample setlist. Experienced live band with full sound system and lighting. We know what it takes to entertain a crowd! 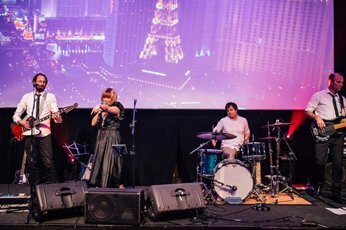 Between us, we have played The Big Day Out, Vector Arena, Homegrown, Rhythm and Vines and multiple corporate gigs, weddings and function launches. We take care of everything so you don’t have to worry. Sound check and setup is efficient and we always show up on time. We can either rock the stage for the best party of your life, or provide a sophisticated backdrop for an event. The band can play a combination of rock, dance, or mellow jazz/soul depending on requirements. We are also available as a duo for smaller gigs. Always well presented, we will dress perfectly to suit your occasion. Wolves and Ravens will make sure the volume is ‘just right’. We take care of all of our technical requirements and liaise with venues so you don’t have to. We can also help you with microphones for speeches and other sound requirements for your event. We are experts in event entertainment. Not quite sure what you're after? No problem! -We'll talk you through it and help you plan an amazing event. 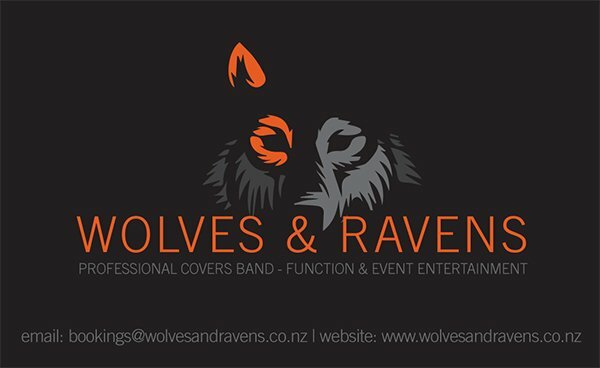 Wolves and Ravens played at our event space in Quay St for a wedding. Dylan and the band were great to deal with, very professional and easy-going, and they kept the party-goers dancing all night. They played a great range of music, which suited the wedding guests perfectly, and accommodated requests without missing a beat. I have recommended them with confidence to other groups who have been looking at our venue to hold their events, and always look forward to welcoming them into our space. Hi Nina and the band! Sorry this is so delayed but we headed away for a bit after the wedding. Thank you Thank you Thank you so much for creating the perfect vibe and energy for our wedding celebration! It was such a spectacular day and evening and your perfect performance and presence just topped it off so well. Everyone has commented on how great you were and you really got the dance floor moving - all night long! Neil and I can't thank you enough for being so accommodating and the trouble you took to come out all that way and to really get into the mood of our day. We will of course be recommending you to anyone we know in need of a fantastic band. You guys were absolutely amazing and we had endless great feedback from everyone about how much they enjoyed the music. I can't thank you enough, you all made it into a really awesome celebration and party. If only it had been a bit cooler in there! I hope you guys enjoyed it as well :) Thanks again! Hi Dylan (and the crew) Thanks for a really great night. You gave us exactly the right music (and volume) for those present. I've had nothing but fantastic feed-back from our members. Awesome!! - It has already gone around town about how good you were, so don't be surprised if others contact you. Very well done. We will definitely look at having you back. 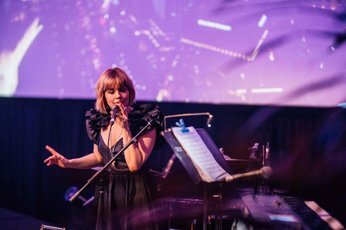 For three years running we have hired Wolves and Ravens to play in the Corporate Marquee at the Taste of Auckland Festival and each year they have delivered to our brief of providing an elegant musical backdrop to the occasion. We love the diversity of Nina’s offering and when asked to raise the tempo, she can certainly deliver. Nina has an gorgeous voice. She was very easy to deal with both before the gig and on the night and wasn't fazed at all when the dinner run over time and had to delay her performance. Great songs, great sound, and a perfect choice for the evening. Hope to work with both of you again. Wolves and Ravens played at our wedding which had a strong focus on live music. They did an incredible job and had everyone dancing all evening. They were really open to song suggestions and learnt our first dance specially for us. We had endless comments afterwards from friends and family about how impressive they were. The set list was superb - just the right mix of dance, rock and popular music - it really covered all bases. Easy to work with and super professional, I wouldn't hesitate in booking them again. Thanks so much guys. Wolves and Ravens did an amazing job at our wedding. We chose them because their playlist was varied and different but still had something for everyone, without being your average boring play something we all know type of covers band…. We really didn’t want that! They were professional, fun, accommodating and incredibly easy to work with, exactly what you want on your wedding day. Every single guest raved (and still are) about the band and how good they were… even the restaurant staff! I just wanted to say thanks on behalf of Neil and I. We were stoked that we had Wolves and Ravens play at our wedding, they were awesome! They have a fantastic sound and they have the best range of songs. They played all of our favourites and they kept everyone dancing all night - we didn't want them to finish! We had lots of people commenting to us afterwards on how good they were. They were really friendly and great to deal with, we would recommend them for sure. 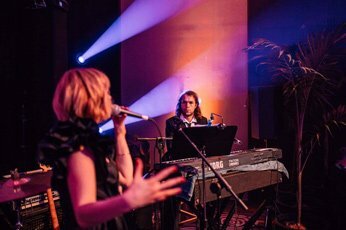 Wolves and Ravens recently performed at a wedding reception held at The Tasting Shed. We've had lots of cover bands through over the last few years for different events, and these guys were amazing! They kept the crowd on the dance floor the whole night, and were one of the tightest bands I have heard in a long time! I will definitely be recommending them to other customers for their next event with us. Please fill our short form with details of your wedding or event and we will get back to you ASAP.